iWAM is DISTINCTIVE because it measures at a higher level of thinking than traditional tools. In fact, it measures what may be unconscious to the individual. The graph below outlines the hierarchy of thinking processes within individuals. Each level controls the level below it. 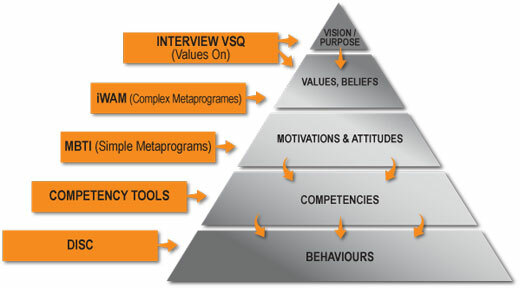 Therefore, as an example, a person’s behaviours will grow out of their Competencies and their Motivations will emanate directly from their Values. So why does iWAM measure motivations and attitudes rather than competencies or behaviours? Because when you measure `higher up’ you tap into the source and drivers of the behaviours. iWAM is a simple, yet profound tool, measuring the work attitudes and motivations that drive competencies and therefore behaviours on the job. This diagram depicts the level of thinking measured by various popular profiling instruments. This model, based on Neurological Levels (Dilts, 1996) depicts the hierarchy of inner processing that drives behaviour. Just because an individual can perform a behaviour or a competency there is no guarantee that they will be motivated to do so, on an ongoing basis. If the behaviour is not in line with a person’s natural motivations they will not be able to sustain it, or if they do, it may lead to stress and burnout. Its rather like `taking out of an empty cupboard’ each day. On the other hand, imagine the energy and enthusiasm a person will have when they are performing skills and actions that grow out of their natural motivations- often it doesn’t even feel like work! iWAM will rapidly and accurately identify what an individual will find comfortable and motivating at work. When there is a natural fit between work demands and the individual’s motivations, there is a higher likelihood of excellent and sustained performance as well as longevity in the position. Many people are interested in knowing more about what drives them but do not like being placed in a category or box. The chances of two iWAM results being identical is almost impossible, statistically speaking. This means that people can relax knowing they will not be `typed’ or compared to other people. One of the major advantages of the iWAM instrument is that it can be used as an accurate pre and post intervention measure. For example, at the start and completion of a coaching or training intervention program. This means that changes in perception, values and even maturity will be reflected in the iWAM results. By statistical comparative analysis of high and low performers in a role, the software identifies the critical drivers and thinking patterns of success and makes a map of it, to be then used as a template for interventions which can bring others to the same standard of excellence. The software will even compare and rank others to this model, signifying the specific areas to coach to lift the performance of the individual. This truly quantitative approach to measuring and transferring excellence allows Companies to have complete assurance in the accuracy and validity of the process.